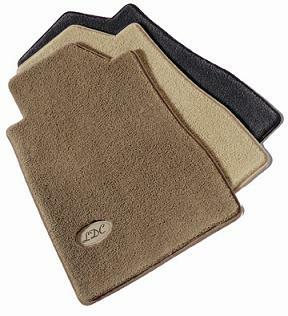 You Won't Find a More Luxurious Custom Fit Mat. ● Sheer luxury, ½” thickness of super soft premium Nylon yarn. ● LUXE Carpet Layer (face): 3 pounds of 2 ply continuous filament nylon yarn in each square yard. Tripl the weight of most OE mats. ● Polypropylene mesh gives the tufted yarn its shape. ● Extra heavy latex layer creates stiffness to help maintain mat shape. ● Water proof layer to keep moisture from the original carpet. ● Final Tractionbac™ composition rubber has natural non-skid characteristics. ● Choice of ten carpet colors to match or complement current and early OEM interiors. ● Factory compatible anchoring devices are included with each set for vehicles with a factory in stalled hook, snap, post, etc. ● Over 6000 unique floor designs. ● Cars, Trucks, Vans and SUV’s. ● Patterns available for most van, SUV and wagon cargo areas. ● Many one-piece full width patterns for greater coverage. ● Trademark emblems: Available with a variety of licensed emblems from General Motors, Ford Motor Co., Chrysler, and Porsche®. ● Optional leather insert with initialed monogram “branded” into leather. ● Three leather colors to compliment the mat color. Choose standard color set up or choose a different color set up at no extra charge. ● The leather insert is recessed and sewn into the lower outside corners of the mat. ● Plain mats ship within two days. ● Trademark emblem mats ship within three days. ● Monogrammed mats ship within three days. 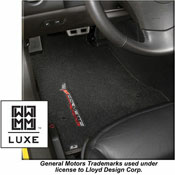 Warranty – LUXE Mats are warranted by Lloyd Design Corp. against defects in design, workmanship and materials for as long as the original mat purchaser owns the vehicle. Defective mats will be repaired or replaced at Lloyd’s option.